This is a recipe adapted from Cheryl & Bill Jamison's book "Born To Grill." The original used pork chops but I had a tenderloin on hand that worked nicely. I added some ingredients in the form of rum, honey and garlic to the glaze. I used red onion instead of shallots as well. The dish is easy to make. Butterflying the pork offers more surface area to glaze on the grill with the banana sauce at the end of cooking. 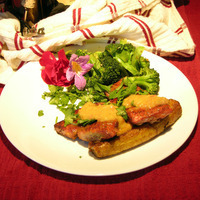 I served it with baked plantains, steamed broccoli and a green salad. As for a wine a fruit forward red seemed in order. I chose a 2009 Jacuzzi Family Vineyards Tracy Hills Sagrantino. 1 1/4 lb pork tenderloin: trimmed of fat & sinew; butterflied and cut into 4 pieces. At least 1 hour before grilling combine the dry rub ingredients and coat the pork with spice mixture. Refrigerate for at least 1 hour so flavors can meld. In a heavy saucepan, melt Ghee over medium heat. Add shallots and saute until transparent; about 4-5 minutes. Add garlic and saute until fragrant; about a minute. Add the remaining glaze ingredients; reduce the heat to medium-low, and simmer for about 10 minutes, stirring frequently. Use an immersion blender (boat motor) to liquify the sauce. Taste for seasoning and adjust as necessary. The finished glaze should be thickened but still pourable. Fire up the grill to high heat. Remove the pork pieces from the refrigerator and let them sit at room temperature for 30 minutes. Grill for about 4 minutes on each side. Brush on the banana glaze turning to coat both sides. Total cooking time should be about 10 minutes depending on the grill heat. Don't overcook. The pork is thin and will cooking quickly. Plate the pork and top with additional glaze. I served the pork with baked plantains and steamed broccoli. Serve remaining glaze at the table seperately if desired. This was really good & different from things I usually cook. My kids enjoyed it too. Looks great. A must try soon.